To provide the satisfaction of the customer in issues such as quality, deadline, price and all other cases. To increase the motivation of employees by placing importance on the education and increasing the motivation. To develope the quality levels by supporting our providers. To use regularly the sources of environment, human and settings in the production, management and control in order to pursue the contemporaine technology. To provide the awareness in order to protect the environment we work. To accord the system conditions of ISO 9001:2008 and to ameliorate the system continiously. To get our company much fertile and much profitable by means of decreasing the cost and wastage rates. To compete with other companies in the sector by means of increasing the quality. ALTUN DÖKÜM SAN. A.Ş. 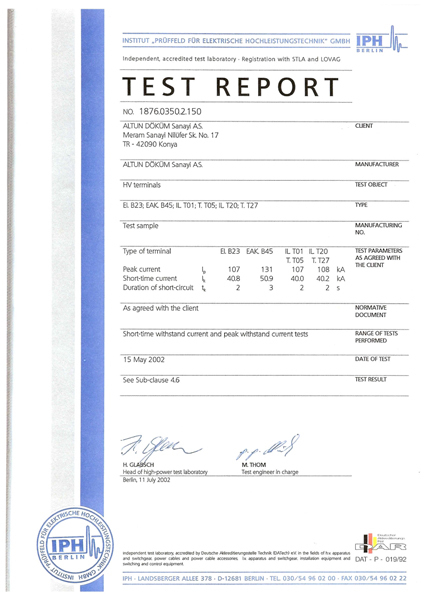 which assumes the quality as a life style has awarded its ISO 9002:1994 document from RW TÜV at the year of 2001. 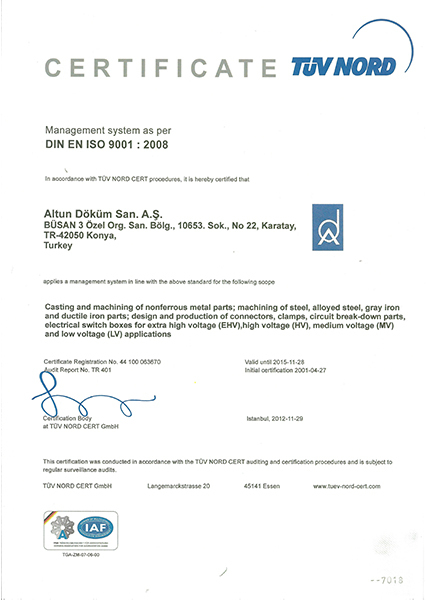 In the year of 2003 the document of ISO 9001:2000 recieved from RW TÜV and ISO 9001:2008 document recieved from TÜV NORD company in the year of 2010 and the present faith of customers has been consolidated. 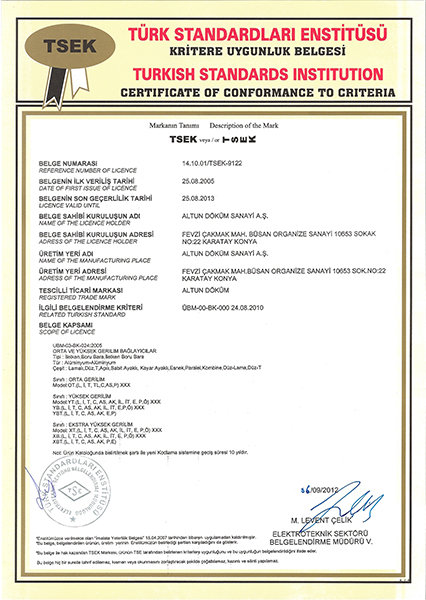 Besides, since the year of 2008 we have the documents of conformity "TÜV SÜD INDUSTRIE SERVICE AD 2000-W0/TRD 100/"
Studies are being made in our company for providing the quality and durableness. 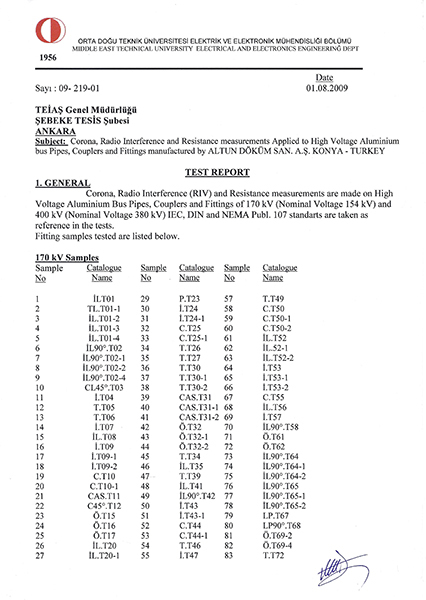 For this purpose, the test of IPH Berlin High Ampere Short Circuit Test, The Bolt Analysis in KOSGEB and " Korona, RIV and Resistance Measurement" experiments are made done which are being applied periodically in ODTÜ on High Voltage Additional Components.